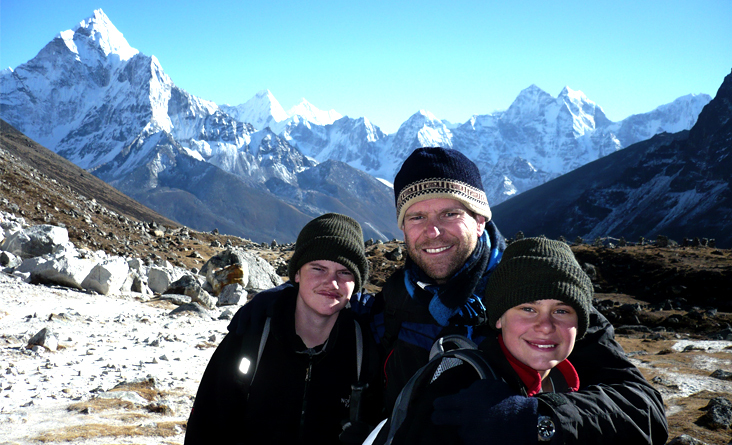 The journey to Everest Base camp trek with kids is more challenging hidden Himalayan adventure trek. Sherpa villages, Highlander prime of the globe Mt. Everest8848 meters Himalaya. The fastest and simplest way to succeed Everest base Camp Khumbu region is by flight to Lukla 2827m. 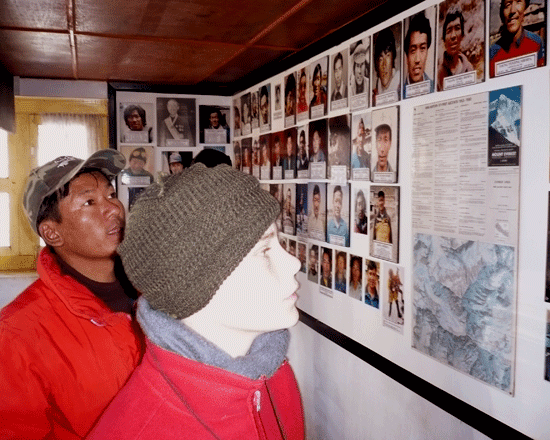 And Phagding, Namche, Tengboche, Dingboche, Lobuche, Gorakshep, and Base Camp. 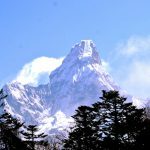 The Everest region has world most massive glaciers, brilliant mountains, forests, animals, birds, monasteries and home of the globe Sherpa people of local cultural heritage. Take care of children’s food diet, as their bodies are quite sensitive to different varieties of food. Check the availability of nearby doctor or a registered nurse at the place of your stay. If the child is tiny, be assured to have a babysitting facility on your family at adventure tour otherwise remaining time you have to hang up with the little toddler. While indulging in any of the adventure activity make sure your child is safe and comfortable, don’t force upon any action on your child especially, in which they show hesitation. First to know: learn more about Nepal and Choose a hike that is short and with a destination that would be interesting to a small child. Flexible: Don’t plan high altitude destination hike that you ignore the signs your child is ready to turn around. To create a lifelong hiker, you want his or her first experiences to be good ones. 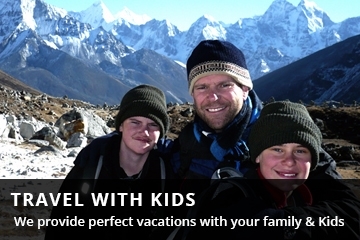 Cost detail for kids at any Trek: trip cost for kids 7 – 8 – 9-year-olds 10% discount, 4 – 5 – 6-year-olds kids 20% discount, below 4-year kids is the complimentary trip, but, extra cost for the extra porter to carry him or her. Pack extra clothes: Always bring a jacket, hat and an extra set of clothes. Stop often for energy breaks: Food and water can be a great reviver and motivator. Pack a lot of patience and praise: It’s all about the journey, so let them explore every corner and cranny while at the same time praising them for their little activities. Day 1: Arrival at Tribhuwan International Airport, meet our Airport Representative or me and transferred by Private car/ Van (depends on the size of group) to a selected hotel stay overnight on B.B. basis. Day 2: Full day Kathmandu valley sightseeing with a professional tour guide (world heritage sites) Bhaktapur Durbar Square, Boudhanath Stupa, Pashupatinath Temple, and Kathmandu Durbar Square with private car/ van (depends on group size) after finished sightseeing Back to Hotel, Stay at a same hotel on B/B plan. Day 3: Fly to Lukla Hillary Airport early in the morning (2827 meters.mtr. 35 minutes flight) trek to Phakding (2/3 hours walking) at evening Visit Sherpa village with your guide and interactions with locals learn more about Sherpa cultures Stay overnight at the lodge. Day 4: Trek to Namche Bazaar (3443 meters. 5/6 hours walking) Namche Bazar is one of the first marketplace of Everest area, every week Sherpa people visit here to shopping things as they need for lodges and houses overnight at the inn. 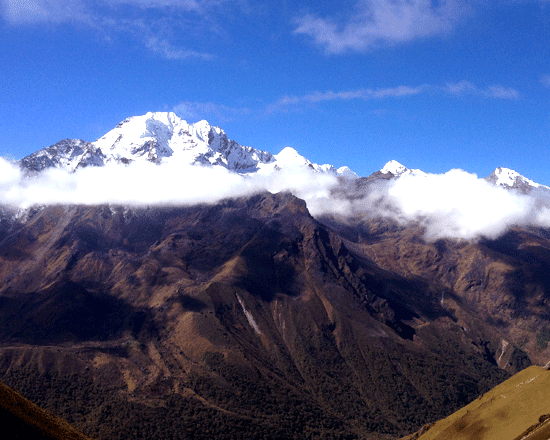 Day 6: Trek to Tengboche (3820 meters.mtr. 5/6 hours walking) Every day 3 pm the monastery has the playtime (puja) visit with your guide and enjoy with meditations stay overnight at lodge. Day 7: Trek to Pheriche (4230 meters. 4/5 hours walking) Stayover night at the lodge. Day 9: Trek to Lobuche (4900 meters. 4/5 hours walking) stay overnight at lodge. Day 10: Trek to Gorakshep, Afternoon Visit to Everest Base Camp (5450 meters.mtr. 3 hours walking) back to Gorakshep stay overnight at the lodge. 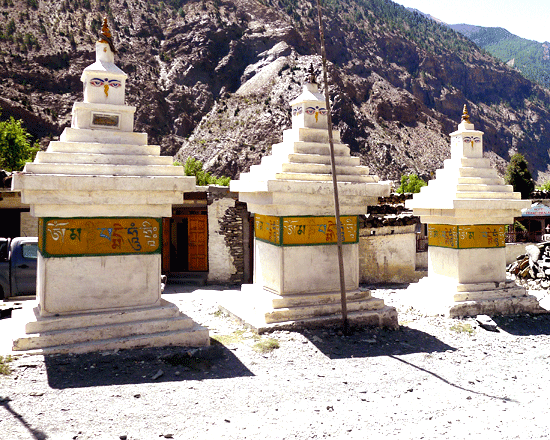 Day 12: Trek back to Pheriche (4230 meters.mtr. 4/5 hours walking) Stay overnight at an inn. 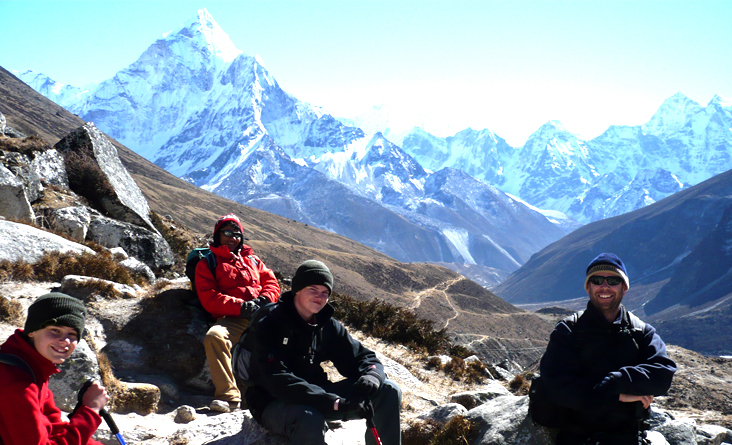 Day 13: Trek back to Tengboche (3820 meters.. 5/6 hours walking) stay overnight at lodge. Day 14: Trek back to Namche Bazaar (3443 meters. 5/6 hours walking) overnight at the lodge. 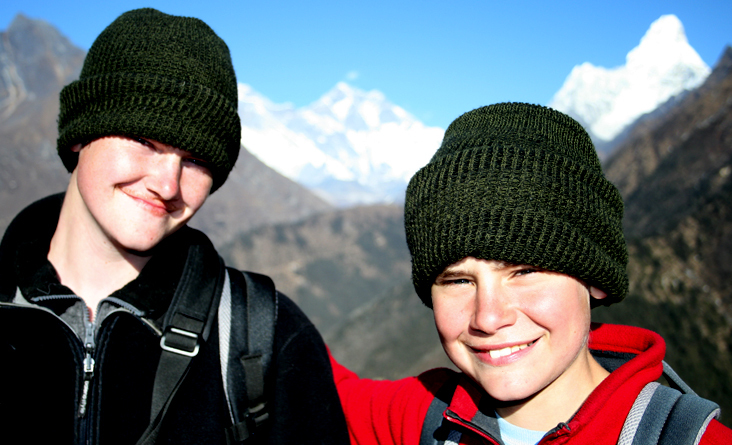 Day 16: Trek back to Lukla (3/4 hours walking) stay overnight at the hostel. Day 21: we provide you airport Transfer by private car/ Van (depends on a size of group) to International Airport for your onward Journey. Note: trip cost for kids 7 - 8 - 9-year-olds 10% discount, 4 - 5 - 6-year-olds kids 20% discount, below 4-year kids is a complimentary trip, but, extra cost for an extra porter to carry him or her. Italian, Chinese, Nepali, Indian, many other European Delicious Meals three times a day (Breakfast, lunch, and dinner chose by Menu with tea/coffee). Clean Lodge accommodation during the trekking. One highly educated, experienced, well trained, fluent English speaking, friendly and government authorized trekking guide who is familiar with this area and required porters (one porter for two clients). 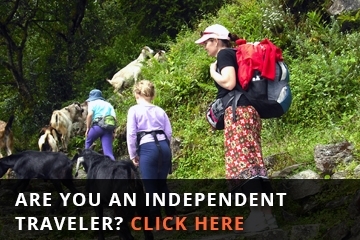 Guide/ Porter's food, accommodation, salary, insurance, transportation, and equipment. Sagarmatha National Park permits and Trekking information management system (TIMS) card. Farewell dinner in Nepali Chulo. 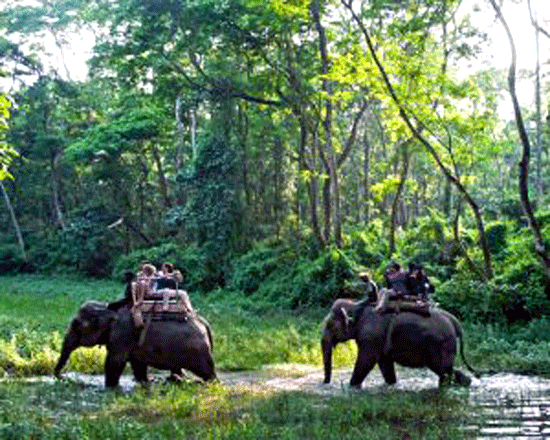 Tips for guide and porters expected but it is not compulsory. 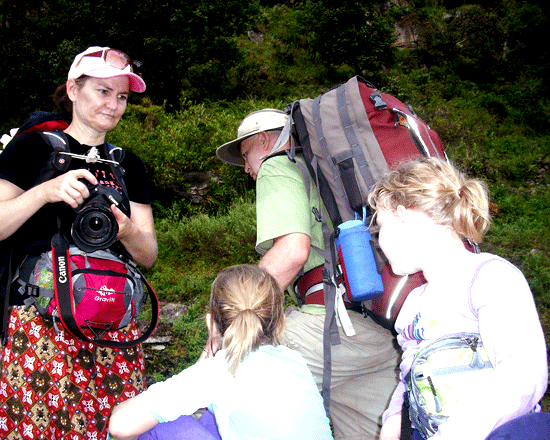 Please let me thank you for the recent and incredible trekking experience we had in Nepal Everest base camp trek with my kids. 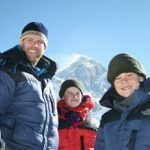 For my sons and I, it was the trip of a lifetime, and I can say that a large part of the success and excitement of the visit to Everest Base Camp Trek with kids was the way you guided the trek. You should be commended for the way in which you took care of all our needs and concerns, the way you helped us achieve all the things we wanted to do, and of course, the knowledge, skill, and enthusiasm displayed throughout the adventure. We had some very tough days, and I realize that without the positive approach and encouragement, we might not have made it to all the places we did – so thank you. I can honestly say that as a guide you exceeded all our expectations for care and responsibility, and this is a great credit to you. I wish you all the best of luck in the future.